Sabil-Kottab of Katkhuda, built in 1744, is one of the most exciting monuments of Shari' al Muizz. It offers richness and ingenuity in it's decorative architectural programs. It was built by Katkhuda of Egypt who was patron of the architecture of his time. AL-Jabarti states that he built and restored thirty monuments in Cairo only. The Sabil-Kuttab has achieved maximum visibility to the main thoroughfare of Shari' al Muizz as it is amazingly free standing fromthree sides.This splendid monument consists of two main parts. 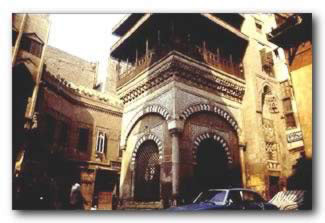 The southern part is two stories high and has the Sabil and Kuttab rooms, while the northern part-notregistered - has three stories and is used currently as living apartments.The building is finely decorated in the Mamluke style of Egypt which continued to dominate Cairene buildings long after the Ottoman conquest in 1553. The two-storey building is open on three sides consisting of grey and white stone inlaid with marble reliefs and tiles and with engaged pillars at the corners.The sabil's entrance has an inscription bearing the names of Ahl al-Kahf, which is a recurrent feature of Katkhuda's buildings. The Kuttab where young children received elementary education in the Quran is located on the second floor.It is a compact and pleasing room composed of five marble columns holding the carved and painted roof. The woodwork in this room is quite elaborate in it's variety and ornamentation. The arches, mashrabiyyas, the door, the cupboard and the coffered ceiling are all wooden masterpieces. By the time of Katkhuda sabil-kuttabs became independent and self sustaining institutions.